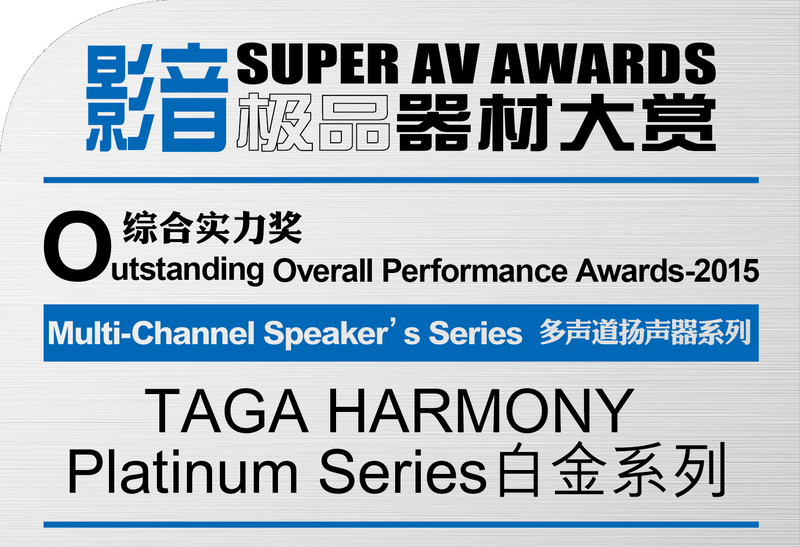 The Platinum series is the premium line of TAGA Harmony speakers. The eye catching, stylish curved cabinets made of strong and thick MDF boards equipped with advanced drivers and high quality crossovers give crisp, clear, natural and dynamic sound performance. The floorstanding models sit on a solid base with spikes that provides stability and good isolation of speakers from the floor. Spacious, clear and detailed high frequencies. Rich, live-like, fast-responding and natural mid frequencies. Strong, low and very well defined bass performance. TLIE - Taga Low Interference Enclosures are made of high-quality 15mm thick MDF boards (12mm for Center and Surrounds speakers) with inside braces (floorstanding models) to increase stiffness and limit any unwanted resonances. Acoustical damping material used inside cabinets eliminates problem of internal standing waves and bass-reflex ports are uniquely designed to reduce distortions to minimum. Floorstanding models sit on solid bases with spikes that provide stability and good isolation of speakers from the floor. HIGH GLOSS PAINTING (selected models)- minimum 5 layers of paint plus 1 layer of the base coat. 1” (25mm) TPTTD Taga Pure Titanium Tweeter Dome with oversized Φ70 magnet, ferrofluid cooling and heavy duty CCAW and silver wiring voice coil, the tweeter can bear high power and its performance is very accurate, clear, smooth and detailed. Specialized horn-like, TWG TAGA Waveguide design of tweeter's faceplate utilizing concave diffusers as well as dome metal grill assists with equal and flat dispersion of sound in and off the axis of the driver. CCAW voice coil ensures crisp, clean and distortion free communication and high power sound. Platinum tweeter can perform up to 40KHz! Rigid and ultra-light TPACD Taga Pure Aluminum cone Driver (with aluminum bullet shaped phase plug and chassis, oversized Φ80 magnet and Φ90 in F-120 model and the models with the 2013 Upgrade Package) with the butyl suspension can move very fast and frequently allowing mid-range frequencies to be very rich, spacious and sweet. Heavy duty combo T-yoke, pure copper voice coil can stand high temperatures and power inputs. The still, bullet shaped phase plug is to align the phase of the audio signal and to smooth the midrange frequency response. TPACD Taga Pure Aluminum cone Driver (with aluminum dust caps and chassis, oversized Φ100 magnet or double Φ110 and Φ100 in F-60 / B-40 models) and heavy duty combo T-yoke, pure copper voice coil, all of which allow for a high power handling as well as deep, precise and detailed bass performance (and detailed, rich and spacious midrange frequencies in mid-woofers models). TPAPR Taga Pure Aluminum Passive Radiator (pure aluminum cone, dust cap and chassis). Very light cone and elastic rubber suspension allow fast and accurate movement of the cone by an internal air pressure produced by bass active drivers. Extra 49g steel load is added to increase a damping factor. High quality, close-tolerance and precisely selected crossovers’ components and internal wires for absolute sound neutrality, high long-term power and reliability. All speakers (including center and surround speakers) use high quality, gold-platted banana binding posts accepting raw speaker cables up to 10AWG and most popular types of connectors. Front speakers and selected bookshelf speakers use upgraded, high-end banana binding posts allowing bi-wiring for wider dispersions and spaciousness, higher sonic accuracy and more precise location. Weight 6.7 kg / pc.